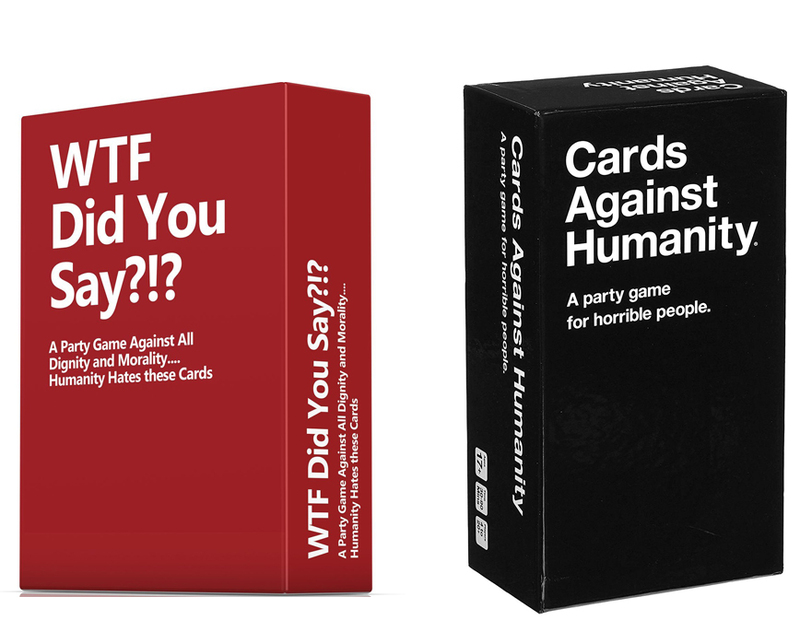 WTF Did You Say and Card Against Humanity are both interesting party game intended for adult. These games contains many adult jokes and dark joke that can only be understand by adult, but this is why these games are addicting. If you are interested in both of them, read our article below first before making your purchase. WTF Did You Say is a party card game that is quite similar to many other card game out there like Card Against humanity and Rotten Apples. This game is also very easy to play and most of you might already familiar with the game play, since it is played the same way you play Card Against Humanity. The package contains 594 cards including white cards for the answer and red cards that contain phrases that needs to be completed. If you are interested on similar card games, read our article on Exploding Kittens vs NSFW here. To play the game, first, the white cards are distributed to all the players, however each player can only get 10 white cards in one round, except for one player.This one player is chosen based on who masturbated in the recent past and this player will be the reader of the cards. The reader then takes one red card and read the text in some manner. After that, all other players will take one white card in their hand, which is funniest facing down to the reader of card. The reader then have to read all the white cards loudly and repeat the red card for each white card. After all white card is read, reader of card then have to pick one funniest card and given the red card to them. The game then continue to play and the winner is the one with the most red cards in their possession. Card Against Humanity is a popular card game, which the player have to complete fill in the blanks statements with another words or phrases that written in a card. Card Against Humanity becomes famous thanks to its offensive, risqué or politically incorrect phrases in their cards. This game is developed inspired by Apples to Apples card game and originated from Kickstarter campaign. The game have various decks that can be combined to makes thing more hilarious. In the Card Against Humanity site, you can see that they are currently offering the green box, sci-fi pack, weed-pack, and period pack. Card Against Humanity is very easy to play and there is no complicated rules at all through the game. To start the game, you have to distribute 10 white cards to each player except one player who called “Card Czar”. This player is chosen based on the person who most recently pooped. Card Czar will first play a black card face up and read the phrase out loud. Other players with white cards then choose one of their white cards, which they think the funniest and give if facing down to Card Czar. The Card Czar then shuffle the white cards and read each one of them out loud and in each white card, the black card must be re-read. Card Czar then will choose the funniest white card and that player will get “Awesome Point”. For the next round another player will be the next Card Czar and the game continue. Both of WTF Did You Say and Card Against Humanity offers adult comedy that will cracks you up including awkward jokes and taboo things, which is why these games should only be played by adult. There is no better than the other in the matter of taste, some people may prefer WTF cards better and some may prefer CAH better, likes them equally or none at all. However some people who played both of them said that WTF Did You Say contains more adult jokes, while Card Against Humanity have many dark jokes and taboo jokes. In our opinion, the choice is all yours to make, but it never hurt to purchase both if you are curious.